In the last post we covered how OVN distributes the pipeline execution across the different hypervisors thanks to the encapsulation used. 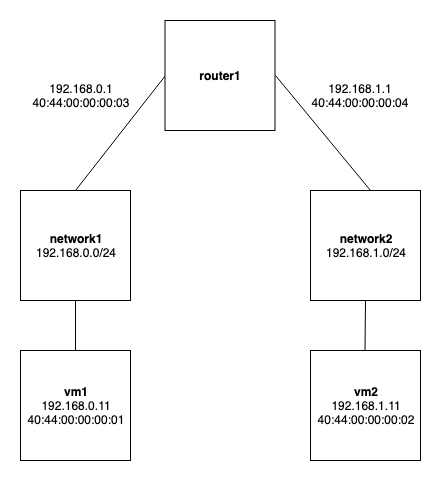 Using the same system as a base, let's create a Logical Router and a second Logical Switch where we can see how routing works between different nodes. ovn-nbctl lsp-set-addresses vm1 "40:44:00:00:00:01 192.168.0.11"
ovn-nbctl lsp-set-addresses vm2 "40:44:00:00:00:02 192.168.1.11"
Worker1 will execute both ingress and egress pipelines of network1. Worker1 will also perform the routing (lines 10 to 28 above) and the ingress pipeline for network2. Then the packet will be pushed to Worker2 via the tunnel. Worker2 will execute the egress pipeline for network2 delivering the packet to VM2. As we can see, the routing happens locally in the source node; there's no need to send the packet to any central/network node as the East/West routing is always distributed with OVN. In the case of North/South traffic, where SNAT is required, traffic will go to the gateway node but we'll cover this in coming posts. When ICMP echo request packets are coming from VM1, we expect them to be arriving via port 2 and being delivered to VM2 on port 8. 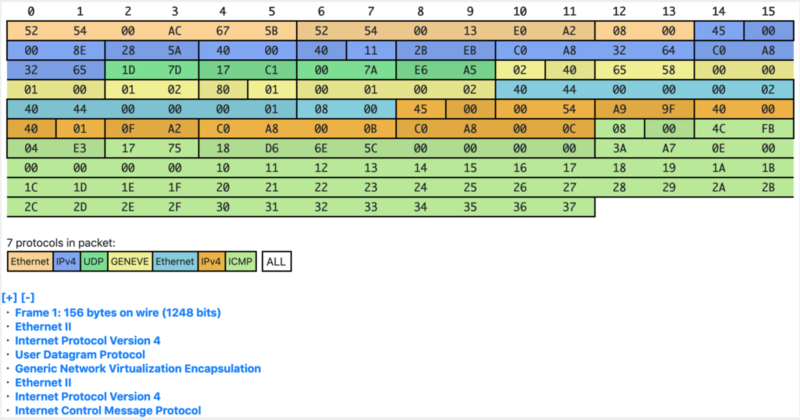 We can check this by inspecting the flows at table 0 (input) and table 65 (output) for br-int. For a more detailed information of the OpenFlow tables, see ovn-architecture(7) document, section "Architectural Physical Life Cycle of a Packet". I was filtering the dump-flows output to display only those flows with an idle_age of just 0 or 1 seconds. This means that they've been recently hit so if we're inspecting tables with lots of flows, we would filter away unwanted flows to focus just on the ones that we're really interested. Please, note that for this particular example, I've set the VM2 link down to see only incoming ICMP packets from VM1 and hide the replies. Copy the 24 bits of the VNI (Tunnel ID / Logical Datapath) to the OpenFlow metadata. Copy bits 16-30 of the tunnel data (Ingress port) to the OpenvSwitch register 14. Copy bits 0-15 of the tunnel data (Egress port) to the OpenvSwitch register 15. Open vSwitch extension register number 14.
set when the packet arrives from a VXLAN tunnel. Similarly, we can see that in the output action from table 65, the OpenFlow rule is matching on "reg15=0x1,metadata=0x8" when it outputs the packet to the OpenFlow port number 8 (VM2). As we saw earlier, metadata 8 corresponds to network2 Logical Switch and the output port (reg15) 1 corresponds to the VM2 logical port (tunnel_key 1). Due to its distributed nature and everything being OpenFlow based, it may be a little bit tricky to trace packets when implementing Software Defined Networking with OVN compared to traditional solutions (iptables, network namespaces, ...). Knowing the above concepts and getting familiar with the tools is key to debug OVN systems in an effective way. In the last post we created a Logical Switch with two ports residing on different hypervisors. Communication between those two ports took place over the tunnel interface using Geneve encapsulation. Let's now take a closer look at this overlay traffic. In our scenario, when we ping from VM1 to VM2, the ingress pipeline of each ICMP packet runs on Worker1 (where VM1 is bound to) and the packet is pushed to the tunnel interface to Worker2 (where VM2 resides). When Worker2 receives the packet on its physical interface, the egress pipeline of the Logical Switch (network1) is executed to deliver the packet to VM2. But ... How does OVN know where the packet comes from and which Logical Datapath should process it? This is where the metadata in the Geneve headers comes in. We can see that the Logical Datapath belongs to network1, that the ingress port is vm1 and that the output port is vm2 which makes sense as we're analyzing the ICMP request from VM1 to VM2. By the time this packet hits Worker2 hypervisor, OVN has all the information to process the packet on the right pipeline and deliver the port to VM2 without having to run the ingress pipeline again. What if we don't use any encapsulation? This is technically possible in OVN and there's such scenarios like in the case where we're managing a physical network directly and won't use any kind of overlay technology. In this case, our ICMP request packet would've been pushed directly to the network and when Worker2 receives the packet, OVN needs to figure out (based on the IP/MAC addresses) which ingress pipeline to execute (twice, as it was also executed by Worker1) before it can go to the egress pipeline and deliver the packet to VM2. For demonstration purposes, we're going to create a Logical Switch (network1) and two Logical Ports (vm1 and vm2). Then we're going to bind VM1 to Worker1 and VM2 to Worker2. If everything works as expected, we would be able to communicate both Logical Ports through the overlay network formed between both workers nodes. ovn-nbctl lsp-set-addresses vm2 "40:44:00:00:00:02 192.168.0.12"
PING 192.168.0.12 (192.168.0.12) 56(84) bytes of data. PING 192.168.0.11 (192.168.0.11) 56(84) bytes of data. As both ports are located in different hypervisors, OVN is pushing the traffic via the overlay Geneve tunnel from Worker1 to Worker2. In the next post, we'll analyze the Geneve encapsulation and how OVN uses its metadata internally. In coming posts we'll cover Geneve encapsulation as well as OVN pipelines and L3 connectivity.